A world renowned physicist, a brilliant bio-tech founder, and a celebrated science biographer walk into a Hillel house… and raise the bar. The recent TEDx ‘Talpiot’ event in Jerusalem (read more about the TED organization here and TEDx events here), in a word, made me feel late. Actually, I got there on the early side, in time to watch the promising young faces file in to the Hillel house at the Hebrew University in Jerusalem. Participants were mostly students and graduate students, with a bunch of professionals in various fields thrown in, I believe, to make me feel less old. By late, I mean to the Do Something Huge for Humanity Party that so few get to attend, although said party is admittedly governed largely by self-invitation. Each talk – which, in the tradition of TED events, was about 18 minutes long – drove home the point that Truly Excellent Developments (not really what TED stands for, at least not till now) are taking place all around us, mostly by people who had made up their minds to make them happen in their early twenties, if not before. The event’s hardworking and visionary organizer, Yoni Litt, is himself a graduate student, and the event’s sponsors, among them Hillel, ROI Community, and Leadel.net, are about encouraging Jewish humanitarian innovation at the grass-roots, often college-age level. We are talking about celebrating start-up people, devouring their passion for their respective missions, and inspiring a new generation hungry to make their own ideas happen… perhaps even over coffee during the break, in the case at hand. At least half of the Jerusalem TEDx speakers use their ingenious ideas and entrepreneurial spirit to contribute to humanity in ways that can easily be defined as good ol’ good deeds. Prof. Zvia Agur is a Brussels-trained mathematician who has pioneered the field of biomathematics and developed a virtual patient model to aid in the optimization of chemotherapy. Based on a mathematical model of an organism’s reproductive pattern in nature during crisis, Agur hypothesized that both cancer cells and healthy cells, faced with chemo, might act like those animals. She founded a bio-tech start-up, Optimata, to develop patient-personalized cancer treatments based on this model. Dr. Maurit Be’eri, Deputy Director of the Alyn Pediatric and Adolescent Rehabilitation Hospital, is an activist for early intervention in pediatric development; Eti Katz is an artist and education pioneer, translating the world and its words and numbers into visual symbols for kids who learn differently. Both dream of a world that is more easily digested by an ever-expanding population of kids who defy conventional development, and are realizing those dreams, on the ground, every day. Avshalom Elitzur is a quantum physics rock star, and to be honest, I understood only his jokes (most of them); if the professor ever runs out of time and space to collapse, he can move on to stand up. Joseph Dadon is a video artist / architect – he filmed Israeli actress Ronit Alkabetz as “Zion,” flitting through the various exhibit areas of the Louvre with a Bible to denote that book’s place at the epicenter of Western culture – who made me LOL with his observation that, “The French Revolution opened the chakras of Europe.” Both of these men made it clear that humanity and genius were completely compatible in advancing each. My favorite talk, though, was the one which seemed to be exploring why we were all sitting there in the first place; noted biology historian and Bar Ilan University Science, Technology, and Society Department Chair, Dr. Oren Harman, spoke about the origins of altruism. Why do members of a species take of their own precious resources to advance causes that may not necessarily advance them individually? Isn’t that decidedly anti-evolutionary? What are we missing when we reason through altruism, and who is kindness really for? This was not only the topic of his latest book on oddball ground-breaking biologist George Price, but perhaps the meta-topic of the entire evening, and its sponsors, and maybe even of TED, of the internet’s talks and lectures and its millions of free how-to videos, and of much of Israeli enterprise in general. For that matter, why do so many want to attend this global Geniuses Do Something Huge for the World Party that the organizers at every international TED and TEDx event, this one included, have to turn people away? And what will people DO with that instinct? Are we bearing witness to the final stages of the evolution of brilliance into a generous phenomenon? Are the days of the intense, reclusive genius over, paving the way for true virtuosity to require, by necessity, it being shared with humanity? Is that what technology has wrought – the popular demand that the gifted share broadly…or be rendered irrelevant? As artistic, scientific and business entrepreneurship and human / social entrepreneurship grow ever more enmeshed, these are THE questions of our age. However old we are. Is the sharing really done in the interest of collaboration, or is just to to show off? Granted, even the latter enhances evolution (as Chris Anderson emphasized in his recent TED talk) by forcing everyone else to ‘step their game up’. However, i’m skeptical whether the competitive forces are really fueled by an altruistic purpose. T – I like that point very much, esp the linguistic spin at the end. S – THAT is sort of the whole spin on altrusim research and theory: Is it ever *really* altrusim, or smtg else? And: Do ulterior motives matter if kindness in action advances humanity? This is what Harman spoke about, but all too briefly – 18 min wasn’t enough. No, sorry, not going to let you off that easy. Whether or not there is ever *real altruism may be debatable and subject to dispute between those favoring group/individual selection. TED is a good example of behavior that can be explained on purely competitive terms but I don’t see it as enhancing cooperation. 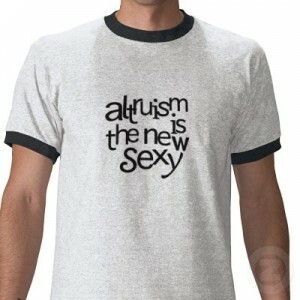 That is why i’m hesitant to call it altruistic. I do think that it makes a difference. In any case i’m definitely going to check out the book. S – Same hesitation I assume applies to most social networking for the theoretical advancement of humanity….poor Miniver Shimon! I think we are way too early into all this stuff to determine if any of it advances humanity; I see connectedness and inspiration as a blessed enterprise that may in the end be its own reward – the most networked and knowledgable will survive when the globe folds in half at the ocean and you find you have the same friends. You are still skeptical b/c maybe you want something to HAPPEN with all the talk. Such a guy.